Paul Hose's career as a drummer is colourful and diverse. Not only is Paul known and respected as a teacher, but as a concert performer, and recording artist too. Paul's live work includes television broadcast productions, arena concerts, festivals, touring theatre shows and much more. Paul has worked with a host of artists from across the musical spectrum including Country star, Sarah Jory, The English National Ballet, Grammy award winning Tom Chapin, producer Steve Chapin and guitar virtuoso, Lee Wrathe. Paul also toured extensively with the A1 Events production, "To be Frank," a tribute to Sinatra and the Rat Pack under the musical direction of Matt Stacey over a six-year period. Paul Hose has been a professional drummer for over 20 years. His career covers a wide spectrum of work; theatre to festivals and clinics to private teaching, Paul's career is colourful and diverse, to say the least. He was taught by several notable private teachers in the UK before going on to study with Dom Famularo and Jim Chapin, who Paul studied with for 6 years. Indeed a highlight for Paul was playing and speaking at Jim's memorial at the Paramount Theatre in New York City. He will soon graduate as an Associate of Trinity College. As an educator, Paul has taught in state schools and music institutions in the the UK and in Singapore. He also owns MLC-Academy, a music school based in Nottingham with subsidiaries in France and New York. In 2004 Paul wrote all of the sight reading tests and chose all of the performance pieces for the 2004-2006 Trinity College drum kit syllabus and his own book, Drumset for Beginners (Hose/Farey) was published by Alfred in 2010. He has played many clinics and festivals with the likes of Jojo Mayer, Dom Famularo and Ray Luzier and indeed continues to perform clinics in Italy, France, UK, USA and Canada. As a publisher Paul's company, Apps For Musicians Limited, publishers interactive apps on the Apple iOS, Kindle and Android platforms and he authors courses for mlc-u.com, an online music school that offers both accredited and non accredited music courses. Lessons with Paul are fun, informative and interactive. Technology plays an important role in Paul's teaching practice as all of the lessons are filmed and archived for you to review during your practice time. Paul is now working on 2 new titles for Alfred Publishing and is resident at music schools in France and Italy. He will also teach at Berklee College of Music this autumn as part of a 14 date USA clinic tour. I welcome anyone who wants to learn. Young, young at heart, beginner or professional. The lessons will be fun, challenging and rewarding. 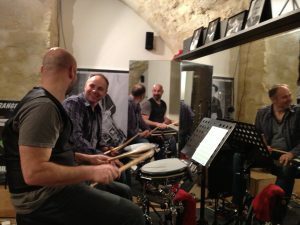 Paul is Education Specialist for Natal Drums and is endorsed by them together with Sabian, Vic Firth and Evans. Paul's work in education has been recognised by the Vic Firth Company who awarded Paul with "An outstanding contribution to teaching." Paul is a member of the MU, NAMM, Antenna and GRAMMY.